Tiramisu is definitely a dessert you will fall for the first time. Tiramisu is an Italian dessert. It literally means "pick me up" or "lift me up", name truly justify the taste of this finger licking recipe. It is made of ladyfingers (Italian: Savoiardi) dipped in coffee, layered with a whipped mixture of egg yolks and mascarpone cheese, and flavored with Marsala wine and cocoa. The recipe has been adapted into many varieties of puddings, cakes and other desserts. Today I am trying to make this tiramisu in form of a trifle. This recipe is real quick and without any raw egg. 1) Mix hot water, coffee powder, sugar and Marsala wine in a large bowl. Let it cool. 2) Whip cream until soft peak. Add mascarpone and vanilla sugar and continue whipping until smooth. Add the 1 tbsp coffee mixture to the whipped cream and cheese and mix well to give that additional flavour. 3) Take the serving glass and starting layering up the trifle. Break the ladyfinger into half and soak it in the warm coffee mixture for about 5 second. 4) Put the soaked mixture at the base of the serving glass layer it with mascarpone cheese mixture. Again put a layer of soaked lady fingers and top it up with mascarpone. 5) Insert a dry ladyfinger at the side of the glass as garnish. 6) Powder some cocoa on the top generously and store it in fridge for cooling until served. Leaving you with few beautiful pictures from Belgium and France to enjoy with this Tiramisu trifle. I love anything grilled, its vegetable, poultry, fish or cheese. Grilling is a form of cooking that involves dry heat applied to the surface of food, commonly from above or below. I am using a stovetop grill pan for this recipe. As we all know, Salmon is a popular food. Classified as an oily fish, salmon is considered to be healthy due to the fish's high protein, high omega-3 fatty acids, and high vitamin D content. An interesting fact about salmon is that they are born in fresh water, migrate to the ocean, and then return to freshwater to reproduce. I am serving this yummy 20 minutes recipe with layered onion sweet corn rice and tandoori grilled vegetable. You can have it with any set of grilled vegetable of your choice. 1) Marinate salmon with lemon, salt, garlic, butter, white pepper and dill. 2) Let the salmon rest in freeze for 15 minutes. Cover it with a cling film. 3) Heat some oil in a grill pan and put the marinated salmon on it. 4) Turn side after 5-7 minutes. Cook till its grilled well. 5) You can use a charcoal grill, a oven or a foil baking with the same recipe. 6) For sauce, mix all the ingredients and together until smooth. 7) Serve hot salmon with this creamy and delicious sauce. 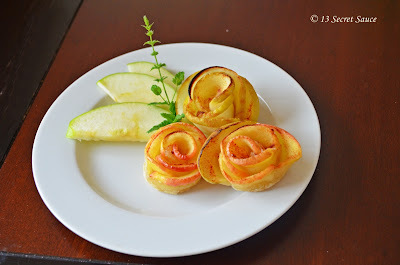 These small roses made of apple will certainly attract you towards its beauty and simplicity. I was tempted to search of its recipe once I saw them on "Pinterest" though I didn't got the recipe, I am trying to replicate the same design. I am using the apple pie recipe to make these lovely bite size delicious desserts. It's a perfect dessert for all fruit lovers and diet conscious people. 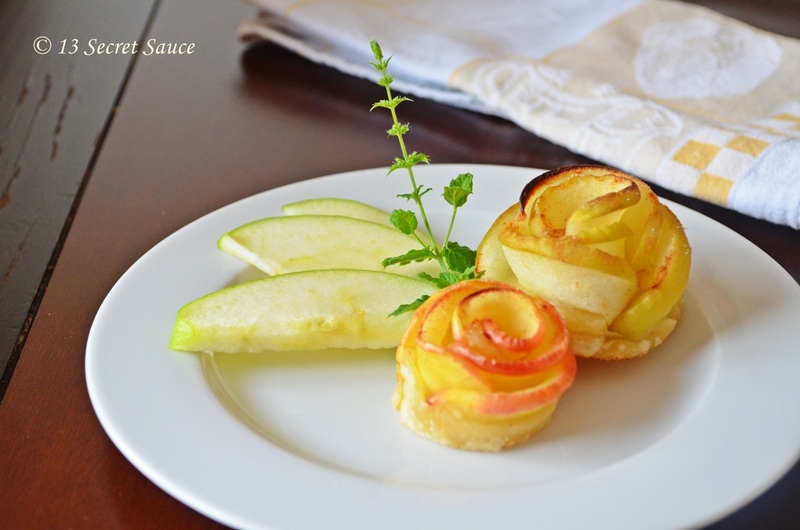 A little sugar and apple's sweet and sour taste make it a perfect dessert or snacks for any occasion. 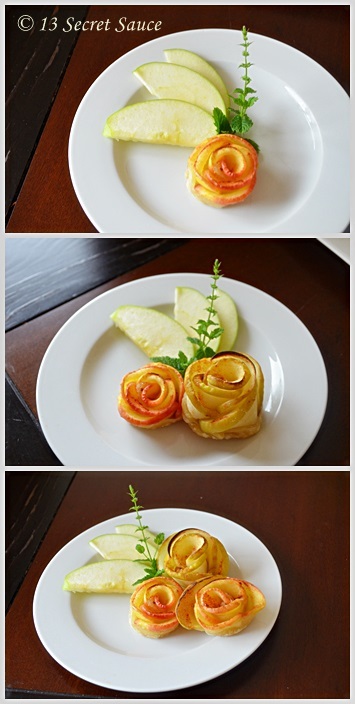 1) Slice the apple half and cut it in thin slices neatly and carefully. 2) Boil sugar in 2 cups water and the sliced apple with lemon juice. 3) Let it cook for 3-4 minutes or until slightly soft. 4) Strain and let it dry on a flat surface or a big strainer. Place the apple slices separately. 5) Cut 1 cm wide and 12 cm long strips from the pastry sheet. 6) Arrange the apple slices on the strip overlapping each other (as shown in picture). 7) Start rolling the strips from one side to make a rose like a shape. 8) Sprinkle some vanilla sugar and cinnamon powder over the rose pie. 9) Grill it in a preheated oven at 180 degrees for 20 minutes and serve hot. These little tomato cups filled with spinach, mushroom and cheese with baked egg on top of it is a real yummy and healthy option for a quick breakfast or lazy evening snacks. I absolutely love the idea of making healthy recipes with easily available ingredients. With its scrumptious looks it also has the goodness of spinach and mushroom. Egg, spinach, mushroom, tomato, and loads of cheese, what else do you need in a dish to make it exquisite!! 1) Cut the top of the tomato and carefully take out the central seed part of it. It should look like a cup. 2) Heat some oil in a pan and toss blanched and chopped spinach and mushroom. Season it. Toss until cooked and dry. 3) Place the tomato cups in a greased muffin tin to stand straight. 4) Fill in the bottom of the tomato with spinach mushroom mixture. Add 1 tbsp of cheese on to it. 5) Top it up with the egg. Carefully break the egg and separate half of the egg white. Pour the egg yolk in the tomato cup. Oil the tomato top and place it in the muffin tin. 6) Season the egg with salt and pepper. 7) Bake it at 200 degree for 20-25 minutes or until the egg is cooked and done. 8) Serve hot with some salad and dip. Prawns are much lower in calories and fat than chicken yet with much more protein. As well as being high in protein, prawns contain magnesium, which plays a role in bone development and nerve and muscle function; Zinc, which is good for growing bodies, and selenium, an important antioxidant. Omega 3 oils found in prawns assist in blood circulation by lowering blood fats and preventing blood clot formation. This aids blood circulation and researchers believe it reduces the risk of heart attack and stroke. Research also indicates the omega 3 oil acts as an anti-inflammatory agent and so may reduce the risk of a wide range of health problems, including asthma, pulmonary disease, rheumatoid arthritis, multiple sclerosis, psoriasis and inflammatory bowel disease. With so many benefit and taste let get making this recipe. This recipe can said to be innovation/ variation from spring roll a famous in south asian appetizer. 1) Heat 1 tsp of oil in a pan. Add chopped onion, capsicum, cook till soft and dry. 2) Add garlic and season with salt and pepper. Cook for another 1-2 minutes. 3) Add crumbled feta to the mixture once cold. 4) Spread out four filo pastry sheet on a clean work surface, covering the other with damp cloth. 5) Place the spoon full of stuffing on each sheet near the lower edge. Lay a prawn on top of the stuffing with the tail exposed. 6) Fold each sheet over toward the tail, then brush the edge with the beaten egg and roll up, with prawn tail exposed. Make the remaining roll in the same way and place them on the tray lined with baking parchment. 7) Preheat the oven at 180 degree celsius. Brush the wrapped prawn with some oil and bake for 20-25 minutes until light brown or cooked. I have been getting requests for cooking and writing something healthy, quick and super stylish. So here we are with all such kind of recipes coming on my blog for next couple of posts. Keep following to know the secret. For all the superwoman, this is the time to impress your family and friend over lunch or dinner. Today’s recipe is a "Saffron Caressed Vegetable Pouch". It is a saffron flavoured baked vegetable with pesto sauce in filo pastry. This recipe will be a showstopper on your lunch/dinner table. 2) Add the vegetables, pesto, saffron and parmesan. 3) Season and simmer for 5 minutes. 4) Wrap the vegetable in the filo pastry sheet to resemble money pouches and tie it up with green onion leaf around the neck. 5) Grease a baking tray and bake at 180 degree C for 12 minutes. And cook it at grill fan mode for another 1-2 minutes to get that crunchy taste. 6) Serve it hot with salad leaves and tomato salsa.